ULSTER’S POTENTIALLY PIVOTAL Champions Cup Pool clash against Saracens next month will be refereed by Jerome Garces, the EPCR announced today. The Frenchman is an infamous figure in the northern province, after he handed Jared Payne a straight red card for a fourth minute aerial collision with Saracens’ Alex Goode when the sides met in the 2014 Heineken Cup quarter-final. Garces was also the man in the middle for Ireland’s World Cup quarter-final exit against Argentina. Luke Pearce and Marius Mitrea will take charge of Ulster’s other two remaining Pool 1 fixtures, away and then at home to Oyonnax. Munster’s postponed round two encounter with Stade Francais will be refereed by Nigel Owens before JP Doyle takes the return leg in Limerick and France’s Alexandre Ruiz gets control of the pool closer away to Treviso. Connacht’s remaining Challenge Cup pool outings will be taken by England’s Craig Maxwell-Keys (away to Brive) and Tom Foley (home to Enisei). Leinster’s remaining Champions Cup pool matches against Bath and Wasps will be refereed by and Pascal Gauzere and Mathieu Raynal respectively. The Champions Cup organisers have also confirmed the dates, times and broadcasters for the concluding two rounds of the pool stage. All four provinces will all be in action on Saturday 16 January, with Munster given the early start of a 13.00 kick-off at Thomond Park before Leinster host Bath at 17.30 and Connacht take on Brive at 20.45 French time. Ulster will kick-start the final round of fixtures with a lunchtime kick-off against Oyonnax on Saturday 23 January,, with Leinster saying goodbye to the competition at 15.15 in the Ricoh Arena. Munster take on Treviso on Sunday 24 January, kicking off at 14.oo Italian time, 13.00 back home. Email “21 months later: Jerome Garces will take charge of Saracens v Ulster”. 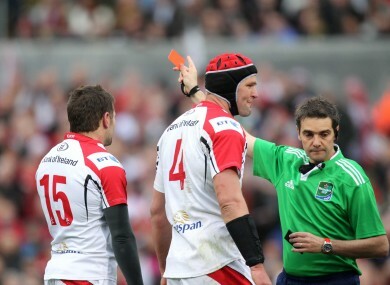 Feedback on “21 months later: Jerome Garces will take charge of Saracens v Ulster”.